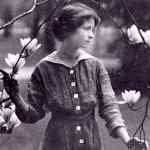 Poet Edna St. Vincent Millay, born on this date in 1892, once asked a friend to send good advice in a letter. “I promise not to follow it,” she said. What advice would you give a friend, and do you think s/he would follow it?